Enjoy your favorite Pokemon in cake form. A Pikachu cake adds a creative twist to any party and emphasizes the guest of honor’s love of Pokemon. A variety of options exist for Pokemon cakes, which you can bake or purchase to please your Pikachu lover. All you need to bake a Pikachu cake yourself is some food coloring, a cake mix, pans, candy decorations and Pokemon figurines. Bake or purchase a cake with a pokeball theme and depict Pikachu bursting out for a creative, Pokemon themed cake. Bake a cake in the shape of a circle. You can purchase a circular cake pan for this, or use a pie pan. Mix frosting and divide it into two bowls. Use food coloring to color the frosting in one bowl red, while keeping the rest of the frosting white. Purchase black decorating frosting in a small tube with a precision tip. Cover the upper half of the circular cake with red frosting and the lower half with white. Add a circle of white frosting to the middle of the cake. Outline this white circle in black, and draw black lines dividing the white and red frosting sections. Place a small plastic Pikachu toy on the cake, as if it had just burst forth from the pokeball. Feel free to write a message to the guest of honor with your black frosting pen on the cake as well. Bake two cakes in regular cake pans. Let the cakes cool and cut them into different sized pieces. Reconstruct the pieces to resemble Pikachu’s face or body. Decorate with yellow icing and paint on Pikachu’s eyes using white icing. 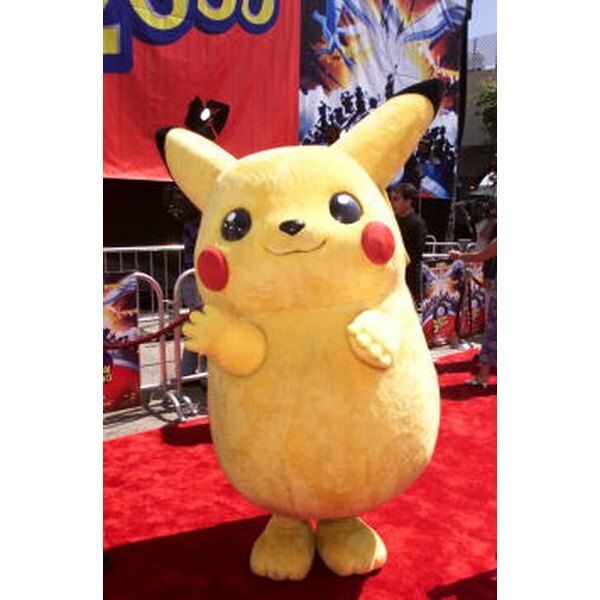 Use licorice strips for Pikachu’s stripes, and red icing for its mouth and cheeks. This cake can also be purchased, although baking it yourself saves on costs and adds a personal touch. Don’t forget to add the name of the guest of honor with a contrasting color of frosting. Bake a cake in a regular cake pan and cut and reshape the pieces to look like a lightning bolt. Decorate with yellow icing and plastic Pikachu figurines. Since lightning is Pikcachu’s primary weapon, a cake in the shape of a lightning bolt is the perfect way to commemorate a Pokemon-themed party. You can also add additional figurines such as pokeballs, other Pokemon and small plastic lighting bolts. Be sure to add on the name of the guest of honor. Bake a square cake and decorate it with frosting in the pattern of a checkerboard. Intersperse white squares of frosting with red frosting squares to represent a Pokemon battle arena. Procure a small Pikachu figurine and another small Pokemon figurine and place them on opposite sides of the cake, facing each other and ready to duel. Your guest of honor will be thrilled to have a cake decorated like a Pokemon battle arena, and will be excited to keep the figurines and enact battles after the cake has been eaten. Emma Rensch earned her B.A. in writing for contemporary media from Scripps College in 2011. Currently, she lives and writes in San Diego.